You know you’re in for a good meal when guacamole is involved – yes or yes? Despite my undying love for all things cheese I do try to scale back on it most days. I have the tendency to go a little overboard with it, ya know? Think Liz Lemon ‘night cheese’ and that’s basically me. So shoutout for avocados and guacamole for once again filling that cheese shaped hole in my heart and on my plate in this Whole30 Taco Salad. Despite the somewhat lengthy looking ingredient list here this salad is super easy to whip up and can be made in easily less than 30 minutes making it a great, weeknight option. Most of the ingredients listed here are spices for the seasoning mix. Since taco spice isn’t something I regularly keep stocked in my kitchen this recipe includes a little DIY version here. Just mix the spices together in a small bowl or cup and that’s it. If you happen to have any on hand/want to speed up the prep process feel free to use your own pre made or store bought taco seasoning instead. The salad base here is made up of chopped lettuce and cherry tomatoes. 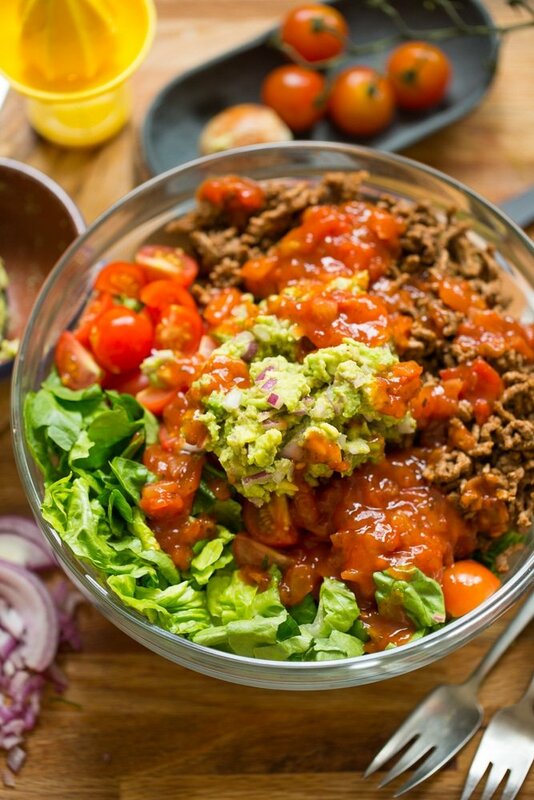 When your meat is browned and seasoned just add it to your salad bowl and topped with some guacamole & salsa. 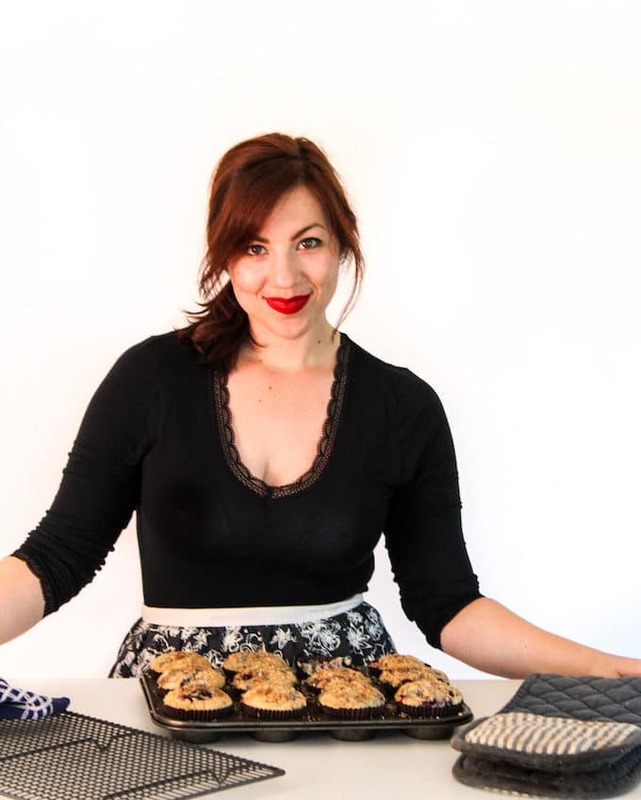 Again, feel free to use store bought versions of these here – just make sure you check the ingredients list for sugar or other non Whole30 compliant ingredients if you’re looking to keep this in line with your diet. For more fleshed out Whole30 dinners this would be perfect served along with things like our Cilantro Lime Cauliflower Rice, Baked Sweet Potato Fries, and Salsa Chicken. It would also be a great side salad to other dishes like out Spiralized Sweet Potato Enchiladas Casserole, Mexican Cauliflower Rice, or added to these 3-Ingredient Grain Free Tortillas. 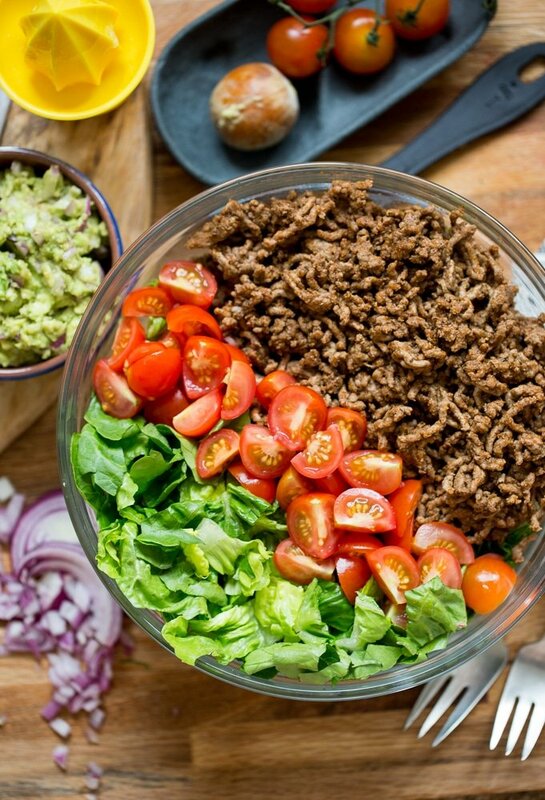 Don’t forget to #asaucykitchen on instagram if you try this Whole30 Taco Salad! I love seeing what you make! You can also post your pictures to my facebook page! In a small bowl combine the taco seasonings: chilli powder, cumin, paprika, oregano, garlic powder, onion powder salt + pepper. In a large skillet, warm the oil. Add the ground beef and cook on medium-high for about 7-10 minutes, breaking up the large chunks with a wooden spoon. Cook until the moisture from the pan has evaporated. Stir in the taco seasoning. Remove from heat & set aside. 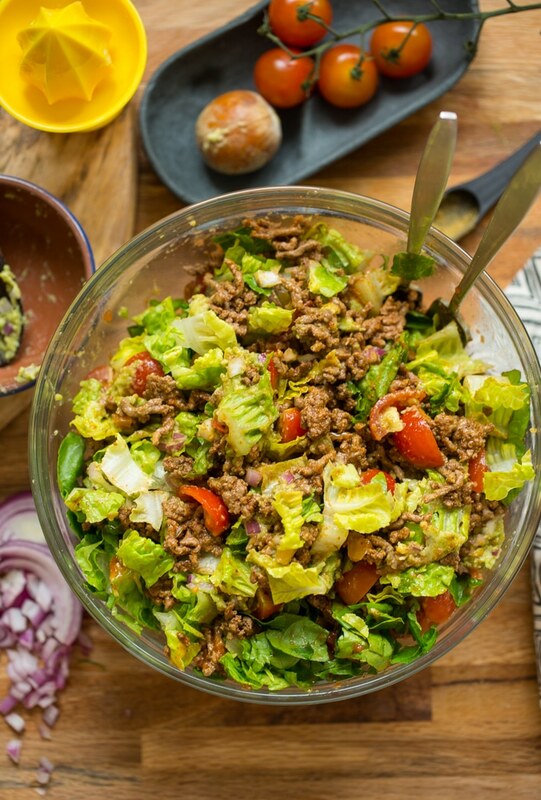 In a large salad bowl combine the chopped lettuce and tomatoes. Add the taco meat when ready along with the salsa and guacamole. Toss to combine and serve. 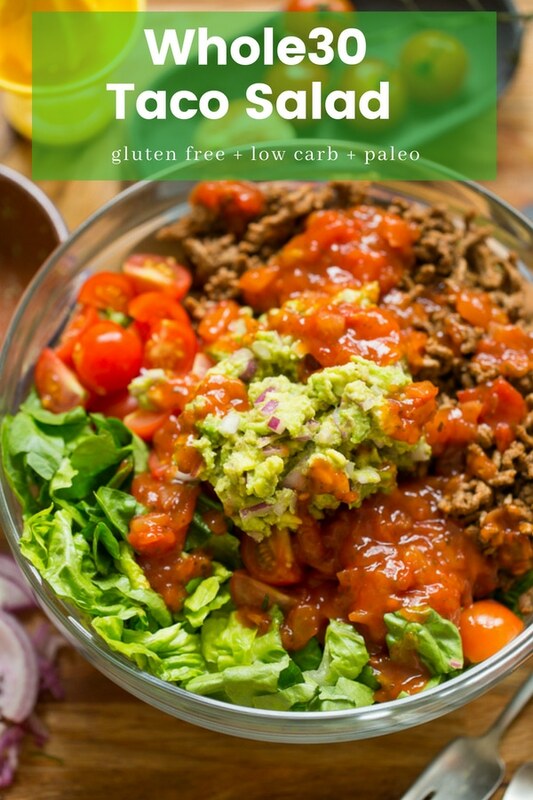 Feel free to use store bought taco seasoning and salsa but make sure to choose sugar free ingredients to keep this Whole30 compliant. Use 3 tablespoons pre-made/store bought taco mix to replace the DIY version here. This will keep for about 2-3 days.